Online Casinos award player loyalty points each time you play. The more you play the more casino points you accumulate. What exactly casinos call their loyalty points program differs from casino to casino. Some online casinos refer to it as a Loyalty Program, other casinos call it a Players Club and still others call it a Casino VIP Points Program. Whatever it is coined, points are generally accumulated at the same rate, usually 1 or 2 points for so much money wagered. When you accumulate a certain amount of points you can then redeem them for free casino money for free play. The longer you play the more points you accumulate and points can accumulate fast, if you have some winning sessions. When casino players deposit frequently they reach vip levels and move up in status in the loyalty points program. When it comes to awarding player points and casino bonuses some casinos are just more generous than others. Before Microgaming left the USA market and we wanted to play slots for real we played at one of the 39 Casino Rewards Casinos. Register at any of the 39 casinos and you're automatically enrolled in the Casino Loyalty Program. As long as we register at the casinos using the same email address any loyalty points our wagering accumulated were collected under one main loyalty account. The main account listed all the casinos in the group where we had opened a real money account. We could then easily redeem the points and play any of the casinos we had opened accounts for. Blackjack Ballroom Casino. The screen displays all the loyalty points awarded from wagering, some freebies and when we redeemed them for real money. 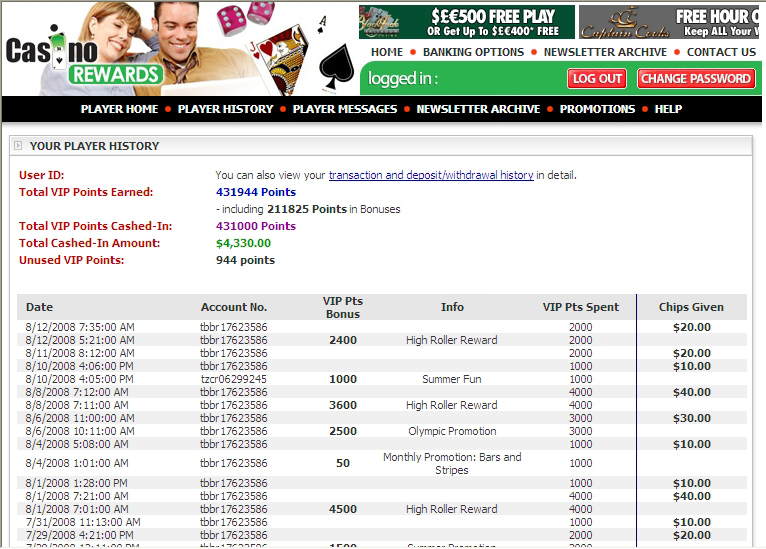 Some of the loyalty points are from High Roller Rewards and Special Promotions. Each month the casinos offers special promotions for playing certain games during the promotional period. Some promotions may award double points for a given deposit while others may award you a number of free slot spins. The promotions change monthly and all the current promotions are listed in the casino lobby. The Casino Rewards Group of Casinos accept most players worldwide except USA and Australian players. When you register at any of the Casinos you're automatically entered into their Casino Loyalty Program where you can redeem loyalty points at any of the partner casinos. Some of Casino Rewards casinos that have the best bonuses include: Casino Action, Casino Kingdom, Yukon Gold Casino.